If you have any type of chronic pain, you might feel as though you have run out of options for pain relief. Receiving an injection for pain can seem like a scary option, but we promise they are not as bad as you think, and the results are worth it. Injections are often used when you have exhausted all other treatment options, and can be a last resort before invasive surgery. There are many different types, for different pain conditions, but there is probably one to suit your needs. An injection is just another way to administer pain relief. This allows the pain relief to directly target the area of pain, giving it a greater chance of you feeling a reduction in your pain. They generally offer longer term relief than oral medications, although this can vary. Injections for pain can be used to treat a wide variety of health conditions that cause chronic pain. They can be used for nerve and muscle pain, as well as issues with joints. Chronic pain can be caused by a number of different reasons, such as an injury, inflammation, or a degenerative disease such as osteoarthritis. While the intention is always to fix the root cause of the pain in order for the pain to go away, this is not always possible (as with some types of degenerative diseases. In cases like this, the injections are used to block the pain so that you do not feel it, allowing you to live life as normally as possible. As well as providing pain relief, in some cases injections can be used to diagnose the cause of your chronic pain if it is otherwise unknown. When used as a diagnostic tool, an injection will be administered to a specific point in the body (for example a certain joint near the pain). If you feel immediate pain relief from the anaesthesia, this implies that the targeted point is the cause of your chronic pain, and you can move forward with more successful pain relief options. If you do not feel immediate results, then your back pain is caused by a different issue, which simply requires further diagnostic injections to other joints or body parts. What kind of injections for pain are there? There are a wide range of different pain injections available, to reflect the wide range of health conditions they are able to treat. Often (but not always), the injections will include both an anaesthetic for immediate numbing relief of the condition and the injection site, and a steroid to reduce inflammation and provide longer term pain relief. Listed are five different injections for pain, to help you understand the range of issues they can treat, and how they are used to treat pain. An epidural injection can be used to treat neck and back pain caused by a multitude of health problems. The epidural injection involves a steroid being inserted directly into the problem area, the epidural space, for relief. These injections numb the pain caused by your health condition, as well as possibly reducing inflammation which can be putting pressure on the nerves, causing the pain in the first place. Trigger points are certain areas in your muscle that are known to be highly sensitive, and as a result, can often cause ongoing pain and aches due to overuse. Trigger point injections are small injections directly into these sites, using anaesthetic and corticosteroids. This is to relieve painful symptoms, and make the muscles temporarily inactive, allowing the pain site to heal without ongoing irritation. Sacroiliac joints are the joints that connect the bottom of your spine to your hips. They can cause pain due to overuse or hypermobility, the joints can become inflamed, making it difficult to walk or move properly. Sacroiliac joint injections are first used as a diagnostic tool, to determine that this is definitely the cause of your pain. Then anaesthetic is injected into the pain site, reducing inflammation and the corresponding pain. These injections are also used to combat chronic back pain. Lumbar facet joints are what connect the spinal vertebrae to each other, stabilising your spine while allowing it to move. For a variety of different reasons, these joints can deteriorate or slip out of place, so that there is huge pressure on the cartilage which can cause pain, or the vertebrae are rubbing together, also causing pain. Lumbar facet injections involve injecting both anaesthetic and a steroid into the painful lumbar facet block, to provide immediate pain relief, but also a long-term reduction in the feeling, while you hopefully regain full mobility of your spine. Steroid injections can reduce joint pain in areas such as your knees, as well as wrists and ankles. They are used to treat injuries, as well as issues caused by degenerative disease such as arthritis. Working the same way as other steroid-based injections, it involves injecting corticosteroids into the problem joint to reduce inflammation. In many cases, the reduction of inflammation may be enough to allow the joint to heal, but in other cases where the health issue has no fix (such as arthritis), it offers long-term pain relief. Using any type of injection for pain relief is just as much about your chronic pain diagnosis, as it is about personal preference. Although they might provide the relief you are looking for, injections just aren’t for everyone, and that is okay! But if you think that they are right for you, the next step will be determining what type is going to provide you with the most relief. For example, if you have chronic back pain, there are a variety of different injections to target this pain, but a professional can help you to understand what is the right option for you, and create a treatment plan. Where should I go for an injection for pain? If you have decided that injections to relieve painful symptoms might be a good option for you, the next step will be to find a medical professional to administer them. 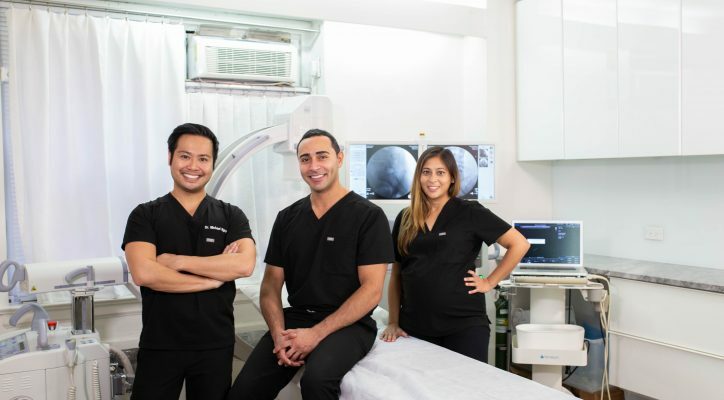 A pain doctor is a professional that specialises in treating different types of pain with various different treatment methods, and they will help you to decide on a service that is right for you. For this type of specialist and this type of pain relief treatment, we recommend that you go to a pain treatment clinic. A pain treatment clinic, such as Pain Treatment Specialists, are trained specifically to fix feelings of pain from a number of different causes. It can be scary and unnerving to receive injections, but with the right pain doctor, you have nothing to worry about. Our excellent team of pain doctors have been trained at Ivy-league schools, and are dedicated to providing the best and newest treatments for patients. All of our facilities are high quality, so you do not need to doubt the quality of the service you can receive. Pain Treatment Specialists also operate as part of the VIP Medical Group, a collective that is focused on the treatment and management of pain. We have multiple locations in New York and New Jersey, so that you can find services that are convenient for you. If you want to know more about any of the injections for pain that we offer our clients, you can check our website, or you can speak directly to a member of our friendly team by calling us at (855) 480-6997.